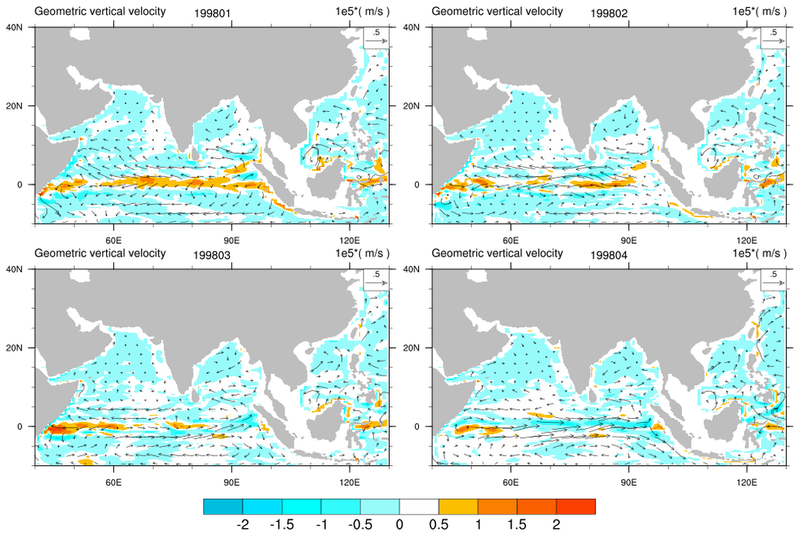 continuous real-time data from the Global Ocean Observing System. 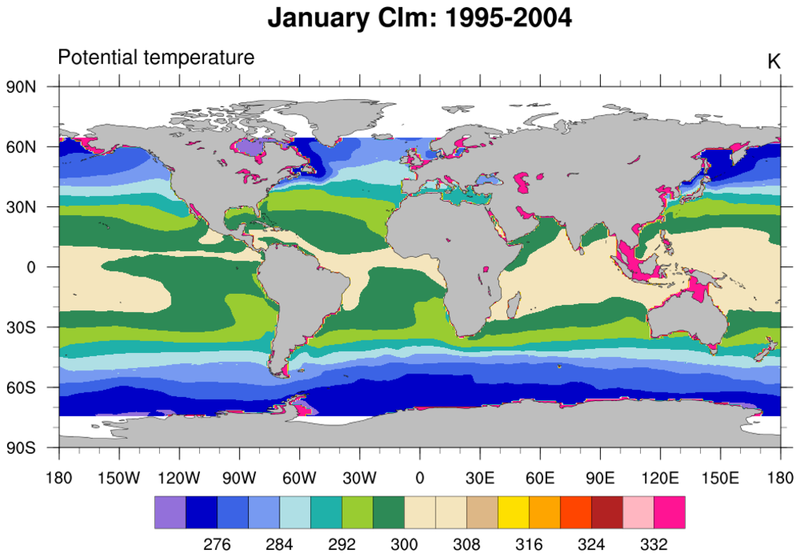 cooperation with NOAA's Office of Climate Observation (OCO). GRIB-1: Monthly and pentad data can be downloaded by clicking on the Binary Data link at the GODAS website. 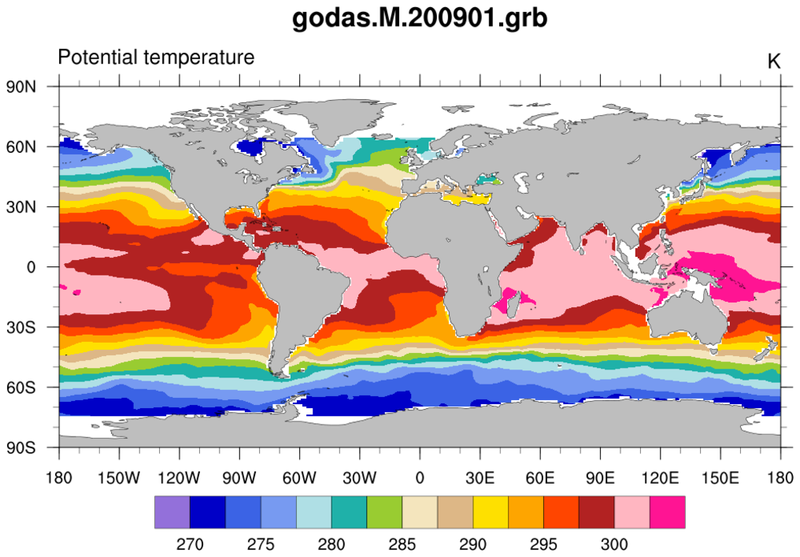 netCDF: GODAS data can be downloaded from the NOAA/OAR/ESRL Physical Sciences Division (PSD), Boulder, Colorado, USA, from their Web site at http://www.cdc.noaa.gov/data/gridded/data.godas.html. The data adhere to the COARDS netCDF convention. The data files contain one variable for each year. One peculiarity with the PSD GODAS files is that they include missing_value and _FillValue attributes that are different (Click here for an example.). NCL only recognizes _FillValue. Hence, the user must make some changes. See Example 4. The output from ncl_filedump on the GRIB can be seen here and on the netCDF file can be seen here. 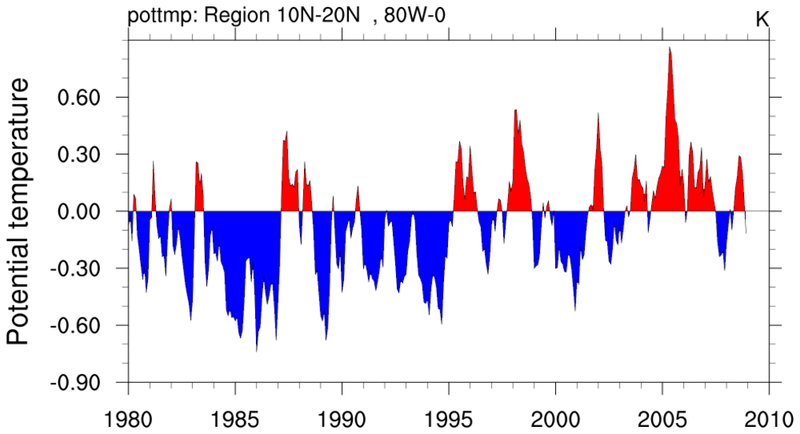 The GRIB file has all the variables for a particular year-month while the netCDF has one variable for each month of the year. NCL will unpack the GRIB directly. 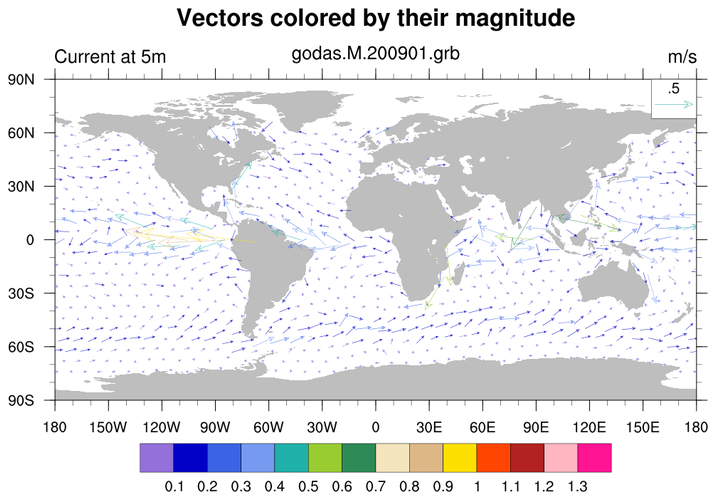 The netCDF files provided by NOAA/OAR/ESRL/PSD contain variables of type "short". The NCL function short2flt can be used to unpack the values and retain all meta data. NCL's coordinate subscripting is used in several of the examples. This allows the use of 'physical coordinates' to access subsets of the data. This is more convenient then using subscript indices. godas_1.ncl: Read a GODAS grib formatted file and create a standard cylindrical equidistant plot. In addition, create two cross-section views: default and raster. 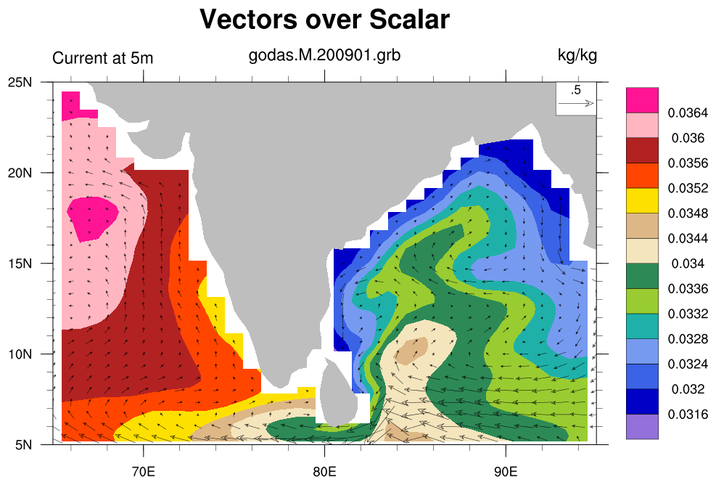 godas_2.ncl: Read a GODAS grib formatted file and plot vectors over a scalar [here, salinity]. A standard cylindrical equidistant plot and two regional plots. 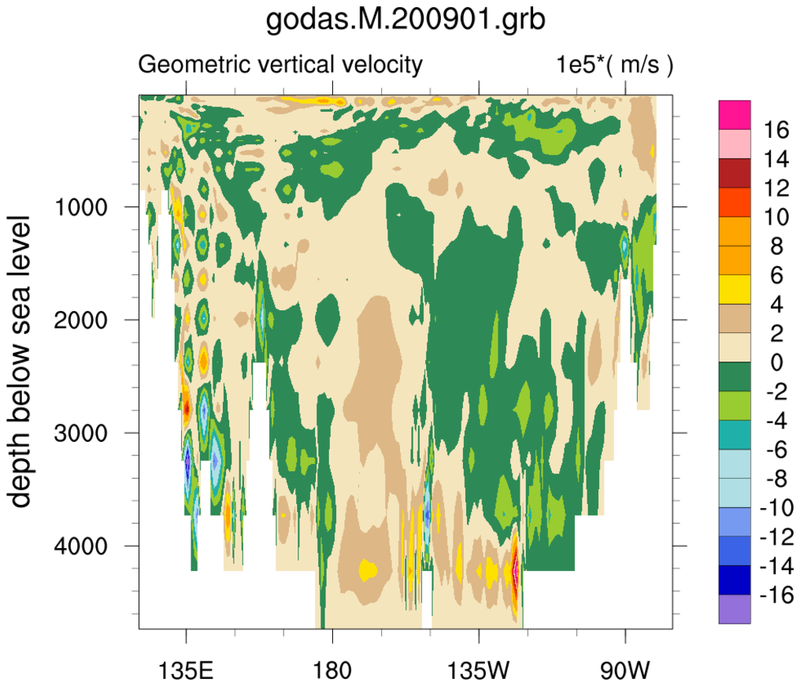 The last plot required the lonFlip function be used to shift from 0-to-360 to -180 to 180.
godas_3.ncl: Read a variable (here, pottmp at a depth of 5 meters) spanning thirty GODAS netCDF files for the period 1980 to 2009; calculate a monthly climatology for 1995-2004; calculate anomalies and create a regional time series of anomalies over a specific region. godas_4.ncl: Read from PSD netCDF files. Manually force the NCL recognixed _FillValue attribute to take on the value of the missing_value attribute. then 'unpack' the short values to float. Create a panel plot.